Your website is a constant amid more dynamic forms of digital marketing. It’s the central hub that represents your business, and provides a landing spot for the prospects that your marketing efforts yield. 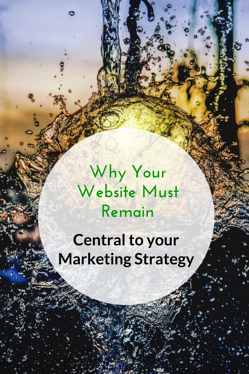 Consider these important reasons to keep your website at the center of your marketing strategy. Everything you do in the digital space will refer back to your website. If you launch a digital advertising campaign through Google Adwords, for example, the goal of the ad will be to entice people to click through to a page on your site. Most social media activity, too, gives either a subtle or not-so-subtle nudge to your followers to visit your website. Also, if your blog is following inbound marketing principles, a landing page on your website will be the conversion point for prospects to deepen their relationship with your company. A website that is updated and an accurate reflection of your business allows you to confidently promote your web address in offline venues. All of your printed collateral has your web address on it. Your web address will also be displayed prominently if your business has a presence at networking events or a table at a convention. When your website is well designed, compelling, and current, you can proudly refer the people you meet to it. A website is the most comprehensive communication tool a business has. There is enough space to expand on all aspects of your business, to include a personal note from the owner, to lay out a mission, and to describe all of your products and services. While it’s important to be concise, there is more breathing room to tell your full story than you have in an ad or social media post. With your website, you have a powerful source of intelligence about people who are interested in your business. By using a site traffic sources report like Google Analytics, you can determine how people are finding your site and which of your digital marketing tactics is producing the most traffic. Sources reports can also identify the search terms people are using to find your business, and identify any links to your site from other websites. This is powerful insight you can use to refine your message and reassess how you are budgeting your digital marketing resources. No matter how multi-faceted your digital marketing becomes, keep your website updated and central to your efforts. Should You Add Staff or Outsource to a Marketing Company?